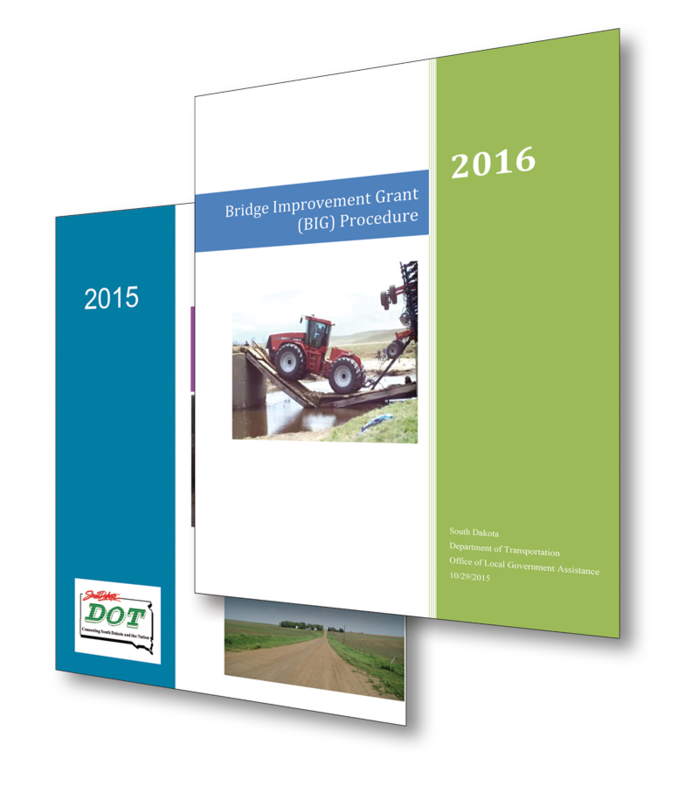 After the South Dakota Legislature passed a road and bridge funding package in 2015, the state’s Transportation Commission needed to create administrative rules for the law’s Bridge Improvement Grant program for local projects. To be eligible for a BIG grant, the law says, a county must impose a wheel tax and have a five-year County Highway and Bridge Improvement Plan. So the Transportation Advisory Council, the South Dakota Department of Transportation’s partnering group for local and tribal stakeholders, got to work. It formed two subcommittees that spent several months drafting recommendations on rules for the BIG program and county plans. The partnering group provided a successful platform to help implement the BIG program, which will begin in 2016 providing $15 million a year in grants that will put a dent in the state’s local bridge rehabilitation and reconstruction needs. 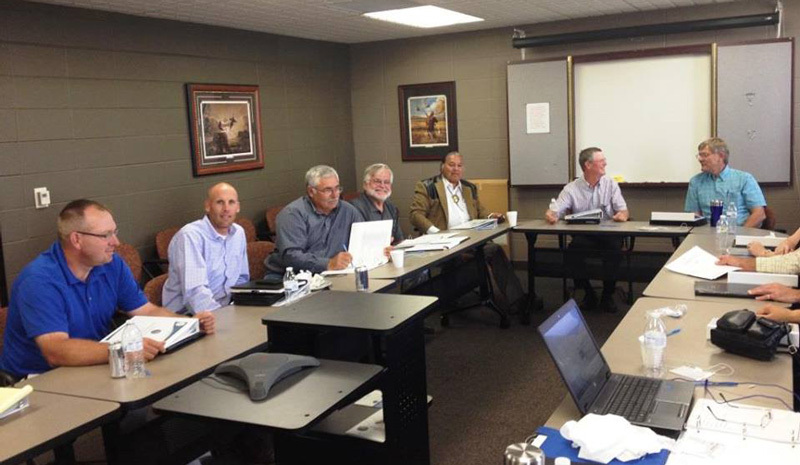 Members represent the South Dakota DOT, American Council of Engineering Companies of South Dakota, Association of County Highway Superintendents, Association of County Commissioners, Association of Towns and Townships, municipal leagues, metropolitan planning organizations, tribes, planning districts, Local Technical Assistance Program and Federal Highway Administration. Not only are members the voices of the organizations they represent, they’re responsible for sharing information with and getting input from their groups. When the group formed, members brainstormed topics to address, including project delivery processes, operational procedures and Federal-Aid Highway Program requirements. “We set up the council to get input on and fill in some of the areas we’ve long had questions on,” said Kinniburgh. Although the council’s most recent focus was on the BIG program, one subcommittee is updating the South Dakota DOT’s Local Roads Plan, a guide for planning, designing and building roads and bridges on local highway systems. The guide will include standard specifications that could save time and money for localities and contractors on projects such as curb and gutter construction. Another subcommittee is developing standardized structure designs that could be used on a variety of local projects. “Most of our local structures are small, single-span structures, so if we can come up with a common design that could be quickly adopted into a site-specific design, it could expedite the replacement process,” said Kinniburgh. At its next meeting, the council plans to consider what other issues to tackle in the coming months. “There’s enough work out there to keep us going for many years,” said Jundt. The Federal Highway Administration developed a template that can be used to create a charter for a local agency stakeholder partnering team. One of the innovative approaches FHWA is promoting through Every Day Counts, stakeholder partnering groups identify issues, review project development processes and work on solutions for local transportation programs. They provide a mechanism for local, state and federal stakeholders to build partnerships based on cooperation, collaboration and open communication. The team charter template is designed to help a state advance a stakeholder partnering effort, define the mission and objectives of the team, and outline the roles and responsibilities of the stakeholders. It includes guidelines for completing the template and alternative language for the team to select from in developing a charter that meets the state’s needs and requirements. Accelerated bridge construction enabled the Iowa Department of Transportation to dramatically reduce road closure time—as well as driver inconvenience and user costs—when it replaced the Little Silver Creek Bridge on Iowa 92 in Pottawattamie County. Motorists traveled alternate routes for about three weeks, compared to six months or more for conventional bridge construction. The project received an Accelerated Innovation Deployment Demonstration incentive award from the Federal Highway Administration to use ABC technology, including prefabricated bridge elements and ultra-high performance concrete connections. The Iowa DOT replaced the 1950s-era bridge to increase its structural capacity and widen the roadway to enhance safety. The new structure is a three-span modular rolled steel beam bridge, the agency’s second project built using the ABC method of modular construction to minimize the impact of construction on highway users. While Iowa 92 remained open, construction crews worked off-site to build the 18 prefabricated deck beam modules that make up the bridge superstructure. The substructure also includes prefabricated and simplified components designed to save on-site construction time. 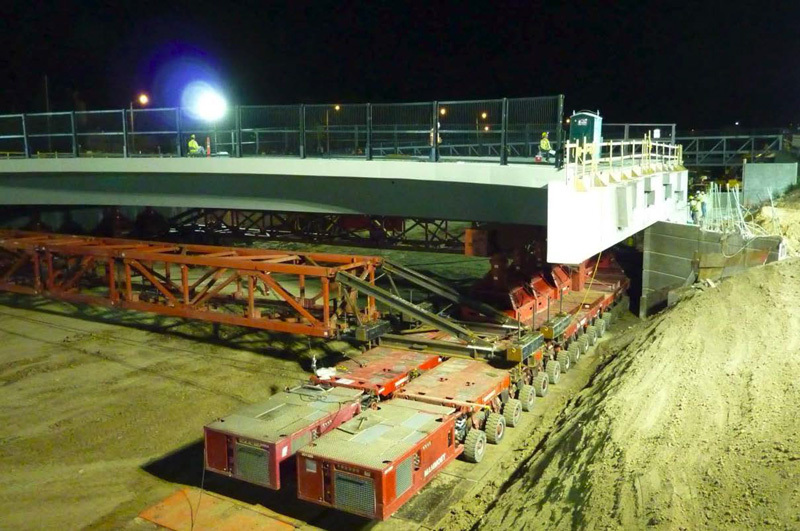 Video: View Little Silver Creek superstructure module placement. 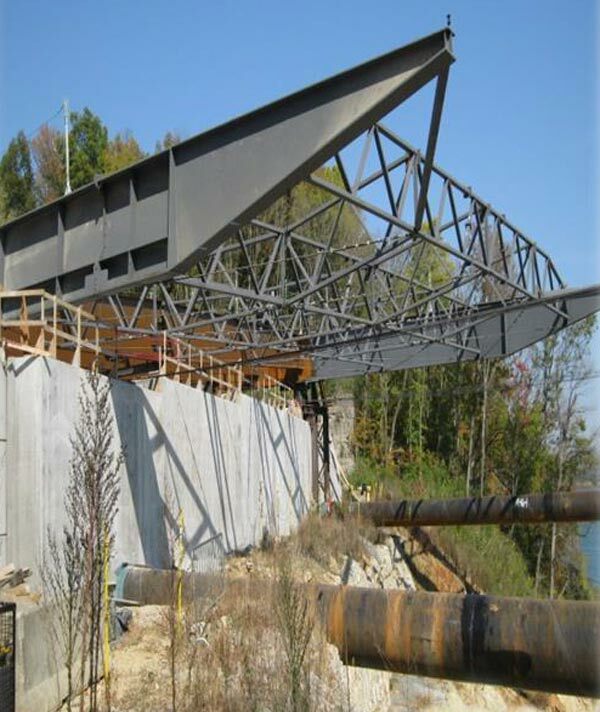 Video: View Little Silver Creek superstructure completion and bridge deck finishing. During a full road closure in fall 2015, crews demolished the existing bridge and moved the superstructure modules into place. They connected the modules with narrow longitudinal joints filled with UHPC, a steel-fiber reinforced material that can improve durability and simplify connection details. They joined the superstructure system to the substructure with UHPC transverse closure pours. In 2011, the Iowa DOT used ABC and UHPC when it replaced a bridge on U.S. 6 over Keg Creek, also in Pottawattamie County. Using innovation on the project, which received an FHWA Highways for LIFE demonstration project grant, enabled crews to replace the bridge during a 16-day road closure, saving motorist months of travel disruption. An FHWA report explains the details. 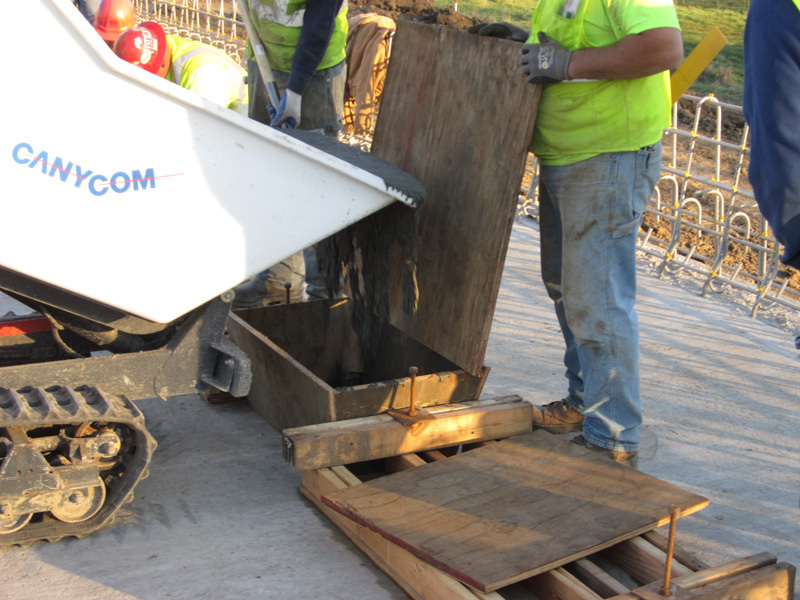 While the Keg Creek project demonstrated the potential of accelerated modular construction technologies in Iowa, the Little Silver Creek project enabled the agency to demonstrate the technologies on a more challenging construction site. The national network of State Transportation Innovation Councils has made progress in the drive to cultivate a culture of innovation in the highway community, but the work is not done, Federal Highway Administrator Gregory Nadeau says. The nation’s 49 STICs—active in 46 states, the District of Columbia, Puerto Rico and the U.S. Virgin Islands—play a key role in leading innovation deployment. They bring transportation stakeholders together to discuss what innovations can have the greatest impact in their states. “The STICs have taken their mission in unique and productive directions,” Nadeau said during the webcast, which also featured Colorado and New York transportation leaders discussing how their states are expanding innovation use. Every state has used eight or more of the 32 innovations promoted by FHWA’s Every Day Counts initiative and some have used more than 20. For more than half of the 11 innovations in the third round of EDC, states have set December 2016 goals that will double the use of the innovations as standard practice. Shailen Bhatt, executive director of the Colorado Department of Transportation, discussed the Colorado STIC’s focus on using innovations such as accelerated bridge construction to drive customer satisfaction. 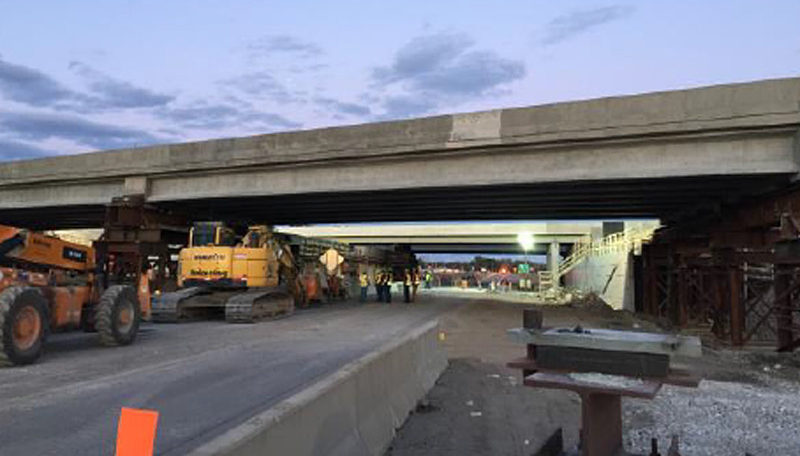 He cited Denver’s Pecos Street over I-70 bridge replacement project, delivered using the construction manager/general contractor method to maximize design and construction efficiency. The project, which received a Highways for LIFE demonstration project grant, included construction of roundabouts and installation of the new bridge with a self-propelled modular transporter during a 50-hour closure of I-70. A customer survey conducted after the project ended found that nearly 70 percent were satisfied to very satisfied with traffic flow on the roundabouts, more than 90 percent were happy with the use of accelerated bridge construction to streamline the project, and more than 85 percent were pleased with the overall project. “It’s clear that when you deploy innovation and accelerated construction techniques, the public notices and that buys you credibility,” Bhatt said. Bhatt previewed the agency’s RoadX program, launched in fall 2015, which involves working with public and industry partners to enhance safety and reliability on the state’s transportation system by harnessing emerging technology. “We’re focused on congestion reduction, improved safety and increased freight mobility as three areas where emerging technology can help us improve the transportation experience,” Bhatt said. D’Angelo discussed the New York STIC’s approach of taking on all of the EDC innovations and developing an action plan for each round of EDC. The plan includes a dashboard that highlights the implementation status for the innovations, plus details on action steps and accomplishments for each innovation. Watch the national State Transportation Innovation Council meeting. An example is the Tappan Zee Bridge replacement, which features seven EDC innovations, including design-build project delivery, 3D modeling and e-Construction. It also uses three second Strategic Highway Research Program products, including complex project management strategies. Like many urban areas, Washington, D.C., can be a challenge for drivers navigating congested streets and planners scheduling road, utility and other construction work that can add to traffic woes. To address those challenges, the District Department of Transportation developed a work zone tool to streamline the project coordination process. The North Carolina DOT collects data on the mobility impacts of manual flagging operations on rural roads. It all started in 2007, when agency officials realized that several road and construction projects in D.C. on busy New York Avenue, in the Nationals Park area and at the Washington Convention Center had interconnected impacts on travelers. 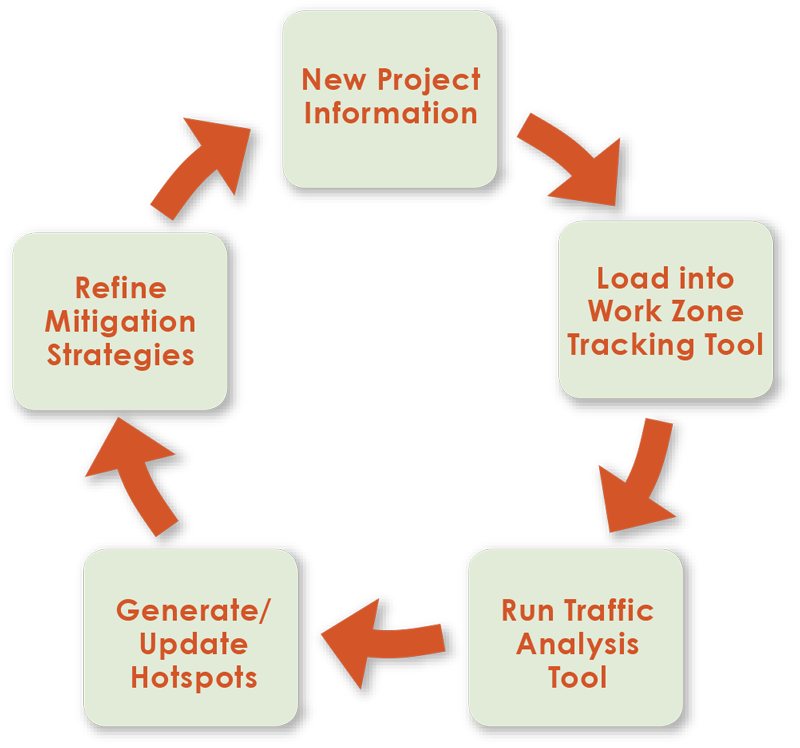 The District DOT developed a software-based Work Zone Project Management System to integrate construction schedules, identify congestion hot spots, analyze traffic impacts and generate mitigation strategies. Now, the District DOT uses the system to create maps and reports, including an annual transportation management plan that examines work zone mitigation strategies by project, corridor and region. The agency arranges meetings with project engineers to find solutions to conflicts, such as schedule adjustments or changes in maintenance-of-traffic plans for projects. It also uses system outputs in developing public outreach and media relations efforts. The District DOT’s project coordination process is one example of how transportation departments across the country are deploying smarter work zone strategies to optimize road user and worker safety and traffic mobility. In the third round of Every Day Counts, more than 40 agencies are using smarter work zones and more than a dozen plan to institutionalize them. The North Carolina Department of Transportation is applying technology to enhance work zones by developing a method to collect data and assess mobility on construction projects in its Statewide Rural Surfacing/Resurfacing program. The technology application involves using a K-band Doppler radar to evaluate performance criteria for manual flagging operations in single-lane work zones. The radar device detects how long vehicles wait in a queue during a 15-minute period. The data collected are used to develop average daily and project mobility scores for the work zone. Having a mobility measure helps the North Carolina DOT make decisions on actions to improve work zone mobility on future projects, such as performing site visits to determine if flaggers are using proper techniques. 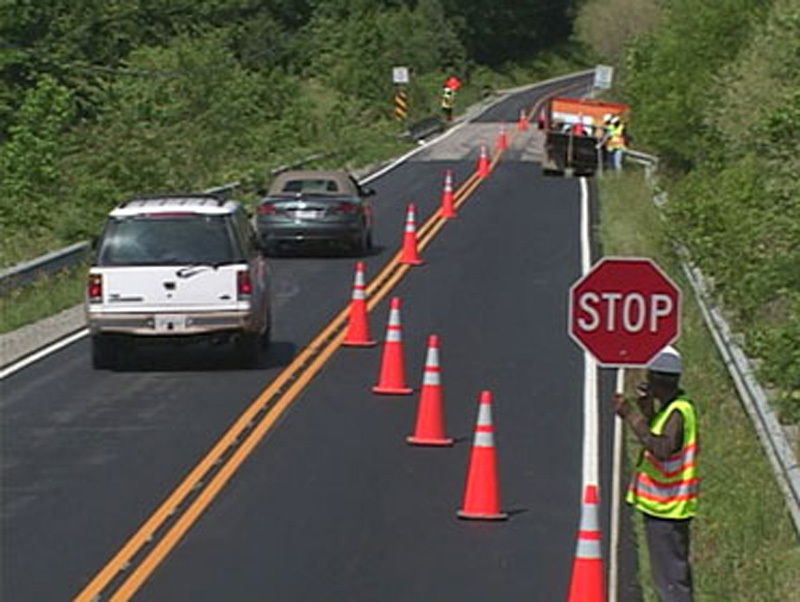 The North Carolina DOT plans to expand its work zone data collection program, initially developing a statewide mobility rating for rural work zones and eventually devising performance measures for work zones on more heavily traveled routes. After enough data are collected, the agency wants to predict the number of 15-minute periods during which poor mobility is expected on a planned project. This type of system could provide information for limiting work zone lane closures during peak times of the day to reduce impact on traffic. View Comprehensive Overview of the Smarter Work Zone Initiative webinar. See the Smarter Work Zones Toolkit for a one-stop online shop for information on deploying project coordination and technology applications. Watch sessions in the smarter work zones webinar series and register for upcoming webinars. For technical assistance and training, contact Smarter Work Zones Innovation Deployment Team leaders Paul Pisano and Jawad Paracha of the FHWA Office of Operations. 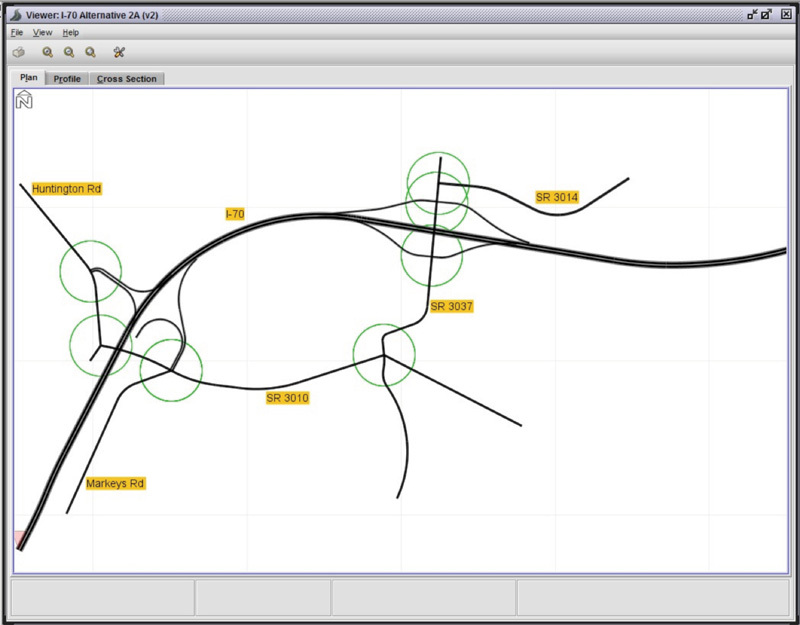 TheInteractive Highway Safety Design Model, a suite of software analysis tools that support data-driven safety analysis, helps transportation agencies evaluate the safety and operational effects of geometric design decisions on highways. The Federal Highway Administration produced IHSDM in 2003 and has updated and improved it every year since then. FHWA released the latest version of IHSDM in fall 2015 and hosted a webinar to explain new features. Crash Prediction Module forecasts crash frequency for highway segments, intersections and interchanges. Policy Review Module checks roadway segment geometry against design policy. Design Consistency Module estimates an 85th percentile speed profile along an alignment to evaluate operating speed consistency. Traffic Analysis Module estimates traffic quality-of-service measures. Intersection Review Module provides a comprehensive diagnostic review of an intersection. Driver/Vehicle Module simulates driving behavior and vehicle dynamics and provides profiles of predicted speed and other variables. 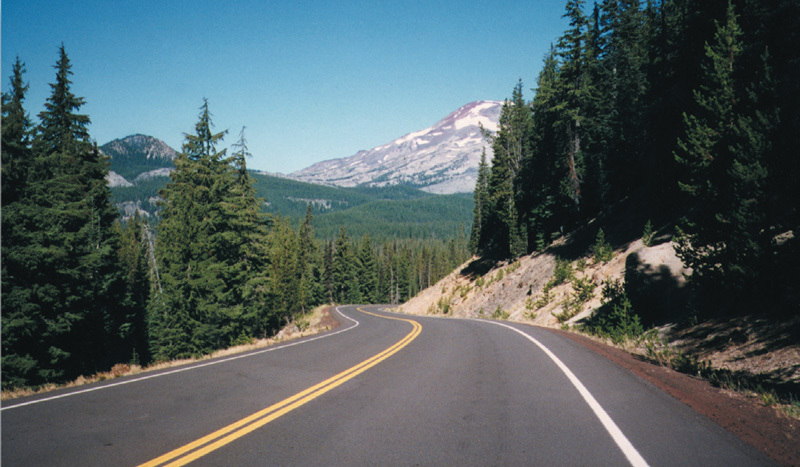 For the 2015 release of IHSDM, the Policy Review Module was expanded to include policy checks for rural multilane highways in addition to rural two-lane highways. The Interactive Highway Safety Design Model helps agencies evaluate highway designs. The 2015 release also expands the Crash Prediction Module evaluation and reporting to include complete interchange-level evaluations. The module is a tool to implement the Part C predictive methods for rural highways, urban and suburban arterials, and freeways and interchanges in the American Association of State Highway and Transportation Officials’ Highway Safety Manual. Typical applications of the Crash Prediction Module include evaluating the safety impact of highway improvements, comparing the safety performance of design alternatives and assessing the cost effectiveness of safety-related design decisions. Use of IHSDM is steadily gaining momentum among transportation agencies. An example is the Louisiana Department of Transportation and Development, which is constructing a high-speed, four-lane, rural arterial highway between I-12 and State Route 21 in Bush. The agency used the IHSDM Crash Prediction Module to predict the number of crashes for each of five alternatives, including a no-build alternative. All four new alignments were designed with the same criteria, but their unique characteristics had meaningful differences in their predicted safety performance. IHSDM predicted that the alternative ranking highest in safety performance would have roughly 10 percent fewer crashes than the no-build option, resulting in a projected $2.3 million cost savings to society. Another IHSDM application example comes from the Arizona Department of Transportation, which used the tool for a pilot project on a section of State Route 264 in the state’s northeast. The geometric improvement alternatives on the rural two-lane road included widening its 1-foot shoulders to 5 feet or 8 feet and improving the superelevation at curves. Projected traffic volume data for the next 20 years, existing roadway data and crash data from the past five years were used in the analysis. After calculating the benefit-to-cost ratio based on five crash severities, the Arizona DOT is moving ahead with the 5-foot-shoulder alternative, which shows the highest benefit-to-cost ratio. IHSDM helped the Pennsylvania DOT identify the design alternative for an I-70 interchange project with the best expected safety performance. In another case, the Pennsylvania Department of Transportation identified a need to modify a set of interchanges because of their operational, geometric and structural deficiencies. The agency focused primarily on two alternatives in addition to a no-build option. The first alternative retained two closely spaced interchanges with some mainline improvements. The second alternative removed one of the interchanges and added a new connector road and local roadway network improvements. An IHSDM analysis revealed that the alternative keeping the closely spaced interchanges was superior in expected safety performance to the alternative removing one of the interchanges. IHSDM training is available through the National Highway Institute in on-site—FHWA-NHI-380071—and web-based—FHWA-NHI-380100—platforms. The Michigan and Connecticut Departments of Transportation are planning two-day on-site training sessions for spring 2016. To date, 14 state agencies have hosted sessions, including an October 2015 session at the Iowa Department of Transportation. Transportation professionals from 29 states have participated. FHWA provides IHSDM technical support via email and help line at (202) 493-3407. IHSDM software is available for free download. A new Federal Highway Administration request for information seeks suggestions for innovations to promote in the fourth round of Every Day Counts and comments on ideas under consideration. For EDC-4, FHWA requests suggestions on proven, market-ready technologies and practices that accelerate project delivery, enhance the safety and durability of roads and bridges, cut traffic congestion and improve environmental sustainability. The RFI comment period closes January 31. FHWA will collaborate with stakeholders to implement the selected EDC-4 innovations in 2017 and 2018. 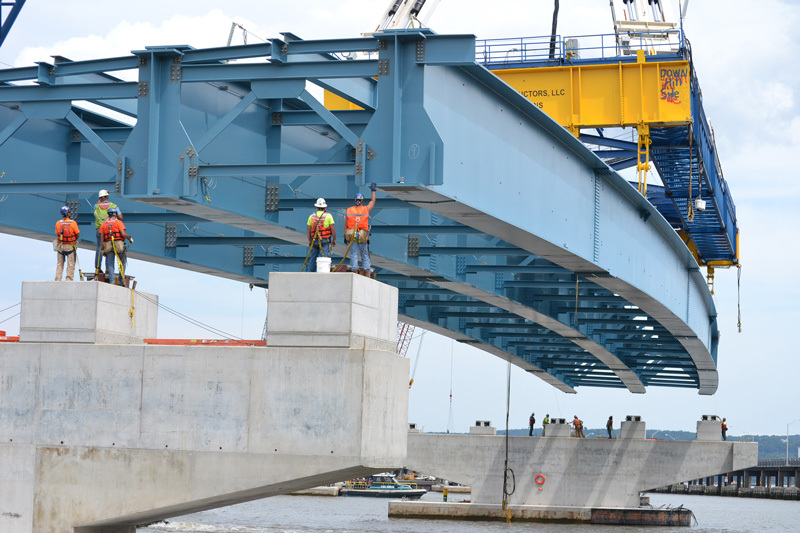 Construction crews launched 110 feet of fully assembled structural steel for the cable-stayed bridge at the East End Crossing of the Ohio River Bridges project connecting Indiana and Kentucky in October 2015. It was Indiana’s first bridge launch, an accelerated bridge construction technique, and contributed to the experience of a few others completed in the United States. Crews used hydraulic strand jacks and chain link rollers to push the superstructure into place. The benefit of launching is that the superstructure is built on the ground, improving safety and quality and cutting construction time. 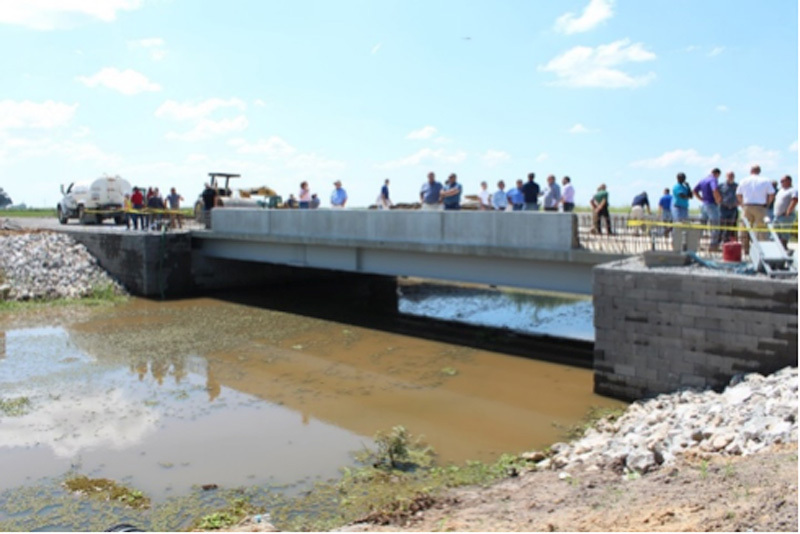 A fall showcase enabled transportation professionals from the Louisiana Department of Transportation and Development and local parishes to view geosynthetic reinforced soil-integrated bridge system construction on a Vermilion Parish project. Before the site visit, participants heard presentations by GRS-IBS experts. The project to replace the Maree Michel and Creek Bridges on Louisiana Highway 91 received a Highways for LIFE demonstration project grant to use GRS-IBS. Several parish officials expressed interest in using GRS-IBS on future projects. A November 2015 bridge lighting ceremony marked the completion of the Kenneth F. Burns Memorial Bridge in Worcester, Massachusetts. Finished three-and-a-half months ahead of schedule, the project is one of five major design-build bridge projects in the Massachusetts Department of Transportation’s Accelerated Bridge Program. The five-span steel deck arch bridge includes bicycle and pedestrian accommodations and dedicated turn lanes to improve safety. The Ohio Department of Transportation used slide-in bridge construction for the first time when it removed and replaced a bridge on I-75 over U.S. 6 during an October 2015 weekend. The contractor began demolition work Friday evening and started sliding the bridge Saturday evening. During the slide, the Ohio DOT closed U.S. 6, but kept two lanes of I-75 traffic open in both directions. The agency chose the lateral bridge slide method for the project to improve safety and reduce traffic disruption. The Utah Department of Transportation uses story maps as a tool to communicate transportation plans to the public. A story map is a collection of interactive maps, tied to the agency’s UPlan geospatial data collaboration tool, that display information with text descriptions, video clips, photographs, charts and graphs. It’s designed to put technical information in a narrative and visual format to make it meaningful to the public. The Utah DOT is experimenting with story maps to describe the vision and plans for the I-15 and U.S. 40 corridors.